Astyr makes his way back to Cioara and Tenge. So excited to go to Wondercon this weekend! Stop by Artist Alley E-15 if you're gonna be there! Free high fives if you're a Sombulus reader! 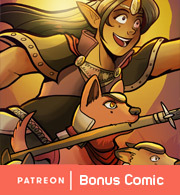 In other news, $6+ Patrons are also seeing a few of my edits for Sombulus Book 3, including new intro sequences for Sydney and Sonia and some secret worldbuilding notes! 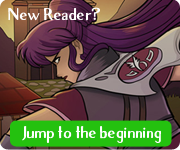 Join them here and help support this comic! Also also I've got a little fanart at Damsels Don't Wear Glasses this week, go over and check it ouuutttt!